Many cities are moving to make public spaces more accessible for everyone, including bikers. While this is not new—cities like Marikina have bicycle lanes—the call for safety, and security, as well as spaces where bikers can freely park is. Makati is one of these localities slowly transitioning as a biker-friendly city with the addition of a new parking rack along Trasierra St. corner Gamboa St. in Legaspi. The rack located behind the Asian Institute of Management can accommodate up to eight bikes and is conveniently located alongside the parking spaces for regular vehicles. Bikers and enthusiasts lauded the addition to the existing racks in Makati which include one inside the Legaspi Active Park and a few strewn around the Greenbelt area. The bike rack prohibits motorcycles, electronic bikes, and electronic trikes from parking as stated in a sign prominently displayed near the parking area. Authorities also warn bikers to lock their bikes when parking to avoid incidents of bicycle theft. 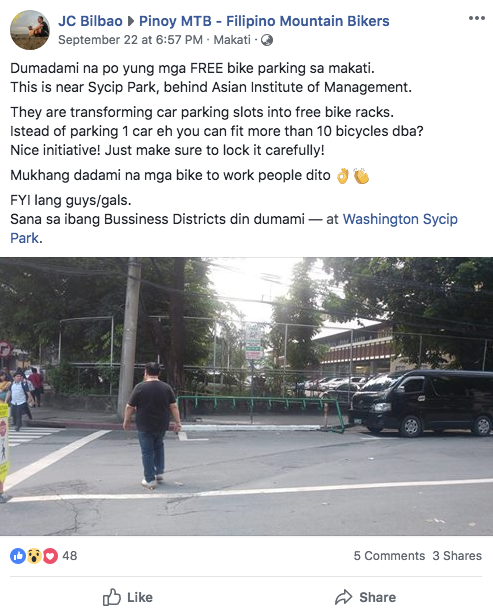 A post to a Facebook group called Pinoy MTB – Filipino Mountain Bikers by user JC Bilbao also noted the conversion of some parking slots in the area into bike parking racks. Paseo Center located at the corner of Paseo de Roxas and Sedeño also has bike racks where bicycles can be parked for free. A group called Bike Parking Spots in Metro Manila on Facebook last year made a directory of bike parking spots in Metro Manila, both free and with parking tickets but was only updated until June 2017. Calling out the QC LGU: These aren’t bike lanes!